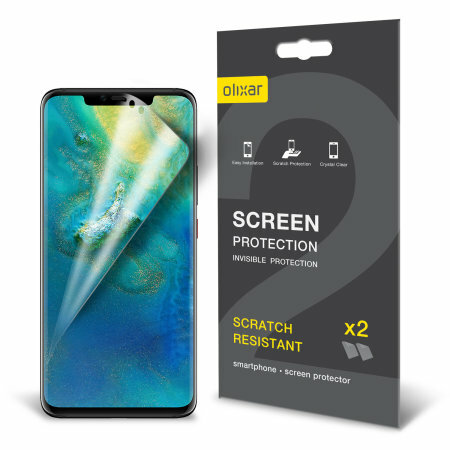 Keep your Huawei Mate 20 Pro screen in pristine condition with this Olixar scratch-resistant screen protector 2-in-1 pack. Great item, fast shipping, super satisfied! Will definitively use again. I hate putting on screen protectors however there ais a 1min video to guide you very easy to follow. Lucky it came with two. I failed application the first tune, although the second time did still leave some air bubbles in the screen. The protecter itself feels pretty nice. I'm glad that it came with 2 as a struggled with the first attempt. Once I got the second one on there were some marks under the protector and I didn't think it was any good. 24hrs later all the marks have gone maybe due to warmth in my pocket and the the screen is crystal clear. The protector fits perfectly and wraps around the curved edges securely. I definitely highly recommend this product. Excellent touch screen sensitivity also. Its like not having one on at all. The protector doesn't work that well with the Mate 20 Pro include case. The edges of the case cause the screen to lift in the corners. I'm an idiot. I wrote a complaint to MobileFun to seek refund when it seemed that the screen protector has a yellowish hue. I even rated about it on Facebook. That yellowish-orange hue is the PROTECTOR of the SCREEN PROTECTOR! In other words, the screen protector IS NOT YELLOW. I had to retract my rant and apologise, but MobileFun was generous enough to send me *another* new pack out of goodwill. Now I feel bad. As for the screen protector, it works perfectly fine. It's not as strong as a tempered glass (understandably) but it does offer legitimate protection from say, liquid glass. Plus, it even comes with 2 screen protectors so if you fumble with the application of the first one - LIKE I DID - then you get a free retry. Once applied, it doesn't feel like the screen is covered with a film at all! It's just as smooth as the original screen texture. It may not be completely invisible - I still see scratch marks - but it's not that visible during normal use. Plus, it's the cheapest option one can get for protection. In fact, not everything is as fabulous as the video. Fits very easily and easily applied. Gives a very slightly absorbing gummy type feel taking knocks and marks. Having issue as it's just a sticker is starting to come unstuck at the edges of the edge curve and now has pocket fluff on the edges, won't be long before it'll need replacing and is only a couple of weeks old. Good quality screen protector. Its does work with the on screen finger print. Better choice than glass screen protector in my opinion. Customer service from olixar also fantastic too. As with other reviews completely messed up the first one mainly because the backing came away from the protector as we took it out of the wrapping and we didn't realise so it ended up destroyed before we could put it on. The second one went on and is a good fit but impossible to get rid of the air bubbles and not sure just how long it will cope with the curved screen before it lifts off. Early signs are that it started to lift of the curve within hours but hoping the case will keep it in place. These are extremely difficult to fit and quite flimsy which makes it impossible to get in the correct place even with all the guide stickers, its worth paying a little more for a more robust protector. Horrible application. Decent screen protector. I messed up on the first attempt. So I'm happy it came with two. Super sticky and lots of air bubbles but thankfully most disappeared after a few days. The screen protector is a fingerprint magnet. So I'm constantly wiping it off. It sticks to the edges great and no other complaints thus far. Good for providing extra screen protection and was really easy to apply with the little guide stickers that are provided. My only issue with it is the screen protector doesn't always sit flush and sometimes clicks when I'm pushing it, in particular for the A button, which sometimes doesn't work. Otherwise a speedily delivered, good product for decent value. I don't know if it's me but I ended up trying to put the first one on the wrong way round so that was wasted. I carefully put the second on and cleaned the screen first, used the card to get (supposedly) rid of air bubbles.... But it's full of them. So that was a waste of money. I'll try to buy some in the shop and ask them to put it on for me. I took a risk that the screen protector actually fitted the screen, and it does. Fantastic screen protector. I've used this before and can't fault it. Unfortunately I ruined both mine trying to put them on, but nonetheless they're excellent when you haven't managed to get dust on the underside of them twice!